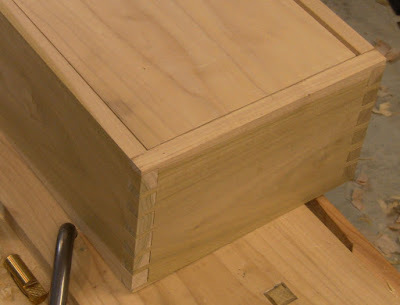 The next project to prepare for the class I'm teaching is to build some simple toolboxes. It wouldn't be cool to show up for class with all my prized antique tools rolling around in plastic bins. No style. I was happy with the way the horse care tote turned out, so I'll use that basic design and add a lid. Nothing fancy, just very utilitarian. Rather than a single gut-busting chest with multiple tills (as Tom Fidgen calls it, the widow-maker! 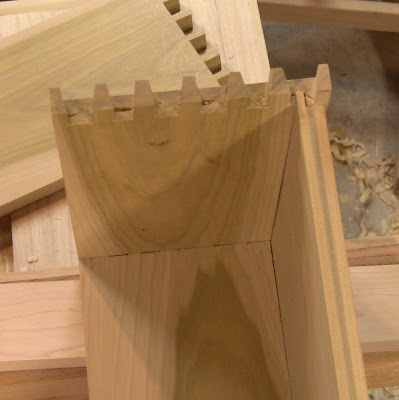 ), I'll build three single-level boxes from dimensioned poplar. I had seen one of the vendors at Brimfield use something like that, and it looked very practical. The modular setup allows me to add more boxes as necessary (I can already see that I probably need 4 or 5 total for the class, given multiple sets of metal, wooden, and transitional planes, plus molding planes). 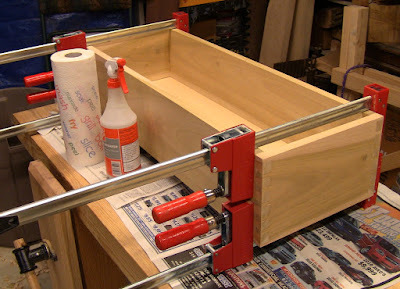 Amusingly, Tom seems to agree, I notice on his blog he recently built some almost identical to what I'm doing! This all may seem like a lot of work and expense to prepare for one class, but these are all the projects I need to go portable. Then I can do craft fairs and such, and hopefully there will be more classes. I'd also like to take some classes myself from Don Weber, Mike Dunbar, Drew Langsner, and Roy Underhill, in which case I'll have these to transport my tools. So I'll be able to enjoy the benefits of all this effort for years. One other point about portable setups. On a nice day, you can take everything outside and work under the spreading maple tree in the back yard. There is no more glorious workshop. How big does it need to be? 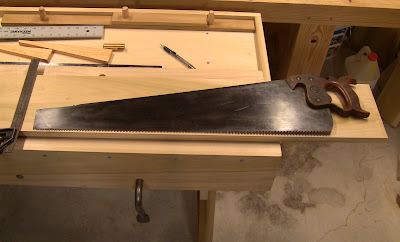 Long enough for this 4 1/2 ppi ripsaw, my longest. 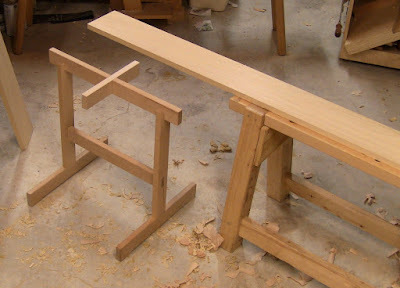 ...so I came up with this slight adaptation to Krenov's trestle sawhorse, a simple cross piece. 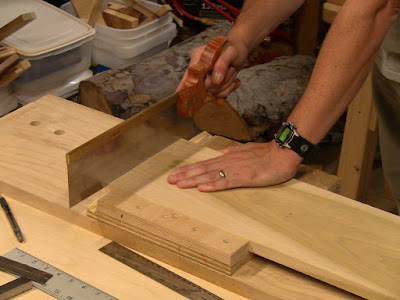 Just slide the trestle under the board like this, and it's fully supported when the cut completes. 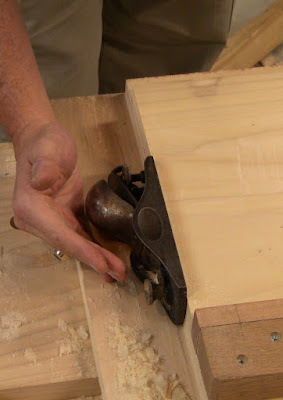 It's just a simple lap joint, 3/4" notch in the main tresle to avoid compromising it's strength, the rest in the crosspiece. 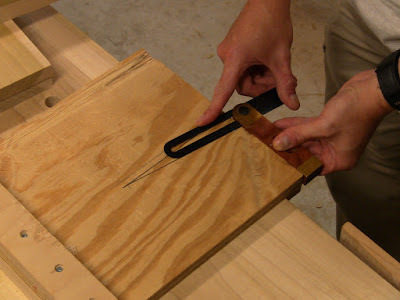 It's not glued in, and the joint is loose enough for quick removal. 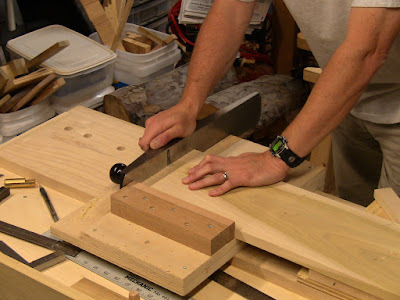 Simpler than making another trestle to use as a second support. Shooting the end for precision square length. 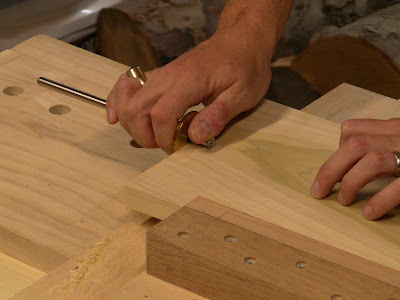 Scribing for the dovetail baseline. 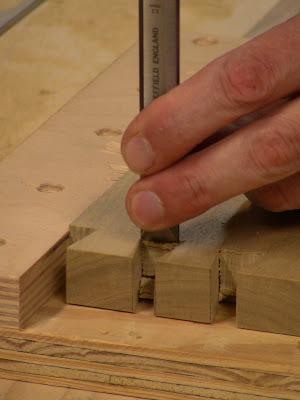 Setting a bevel gauge to 6:1 dovetail slope, permanently marked on my bench hook. Marking a short end piece for pins first. Rough-cutting out the waste. I've decided I prefer this method to chiseling everything out. 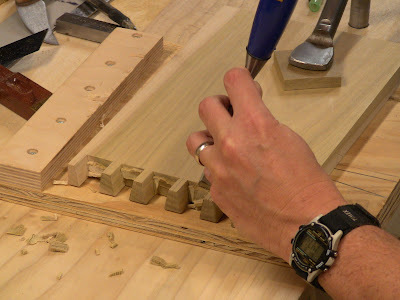 Chiseling out the remainder to the baseline. This is very easy since it's just a thin amount. Marking the tails from the pins. The problem here is that this is a 33" board, resting on the precision-shot end. It stands up fine by itself, but it's too easy to bump aside, fouling up the marking. Next time I'll do tails first. 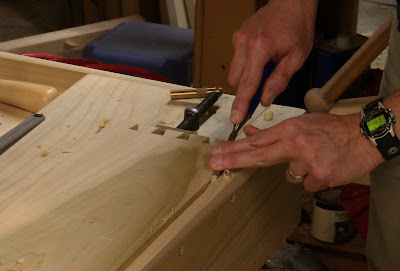 Chiseling the tail waste down to the base line. 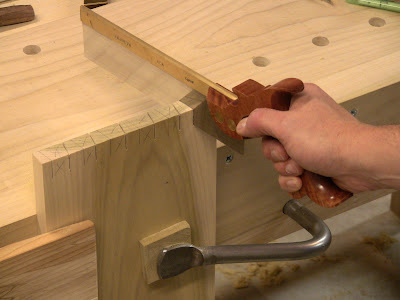 Grooving a side piece for the bottom with a screw-arm plow plane. This is a stopped groove. The end pieces are fully grooved. 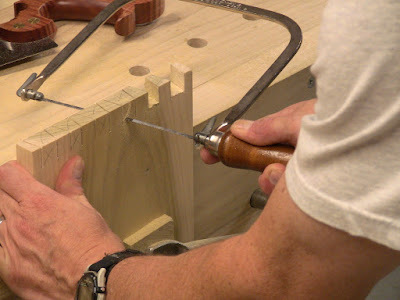 Finishing up the stopped ends of the groove with a chisel. Next is the bottom of the box, glued up from two narrow boards. 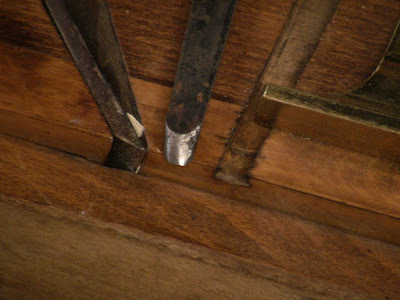 The edge needed to be rabbeted all around to fit in the grooves. The glued-up bottom piece just barely fits on my shooting board. 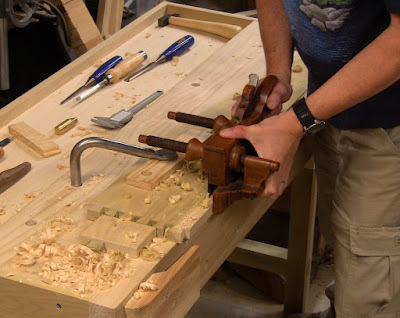 I normally use a large bench plane for this for its mass, but it's too long here. 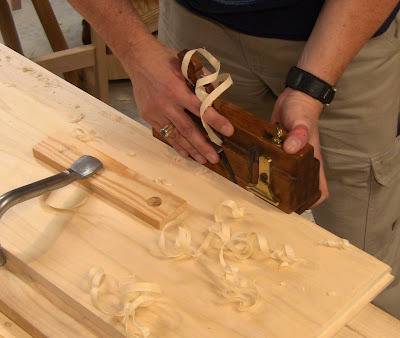 I found that a block plane cups right into the palm of the hand here for a good cut. 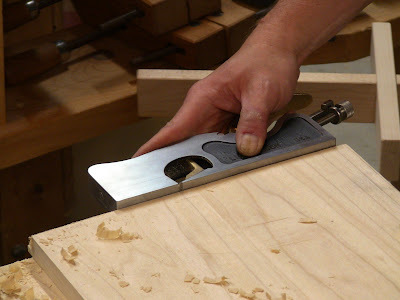 It fits in the hand to direct the planing force perfectly. 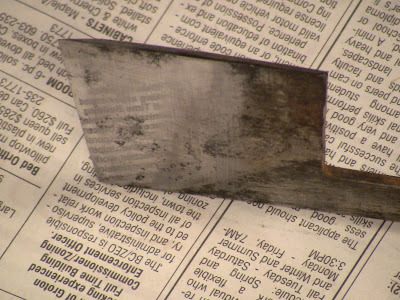 I wanted to use my antique moving fillister plane to do the rabbeting, but the rusty old iron needed sharpening. 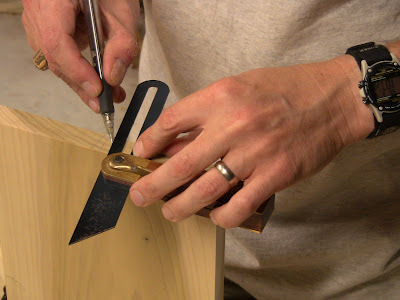 David Weaver over on Sawmill Creek had shown a method of using a simple backing stick jig for polishing the backs of plane irons. 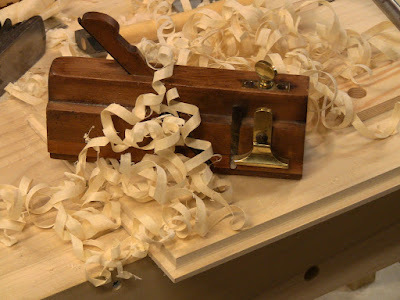 I remembered seeing a simpler version of this in Toshio Odate's book Japanese Woodworking Tools , so I tried it, and it worked great. 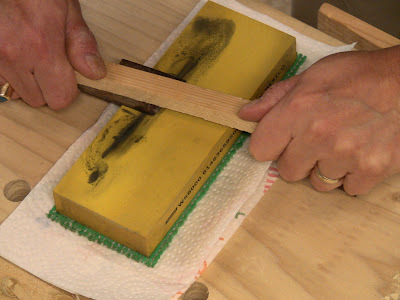 Rough grinding the back of the iron with 80-grit on a double-sided MDF sandpaper block. Heavy pressure on the sandpaper. 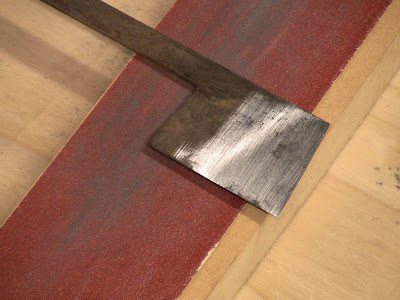 The result after 120 grit. After medium and fine India stones, hard Arkansas. Lighter pressure on the stones to avoid damaging them. Finishing up on 8000 grit waterstone. 5 minutes of work to a near-mirror polished back. 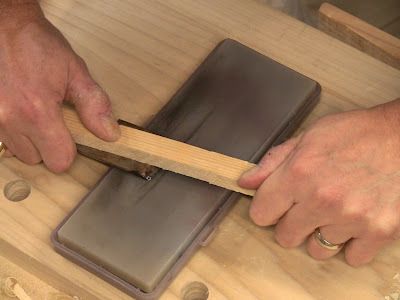 Then I took the bevel through paper, oilstones, and green rouge on a solid cherry strop, 5 more minutes to get to shaving hair off my right arm (my left arm is already bald from working on chisels a few days ago). 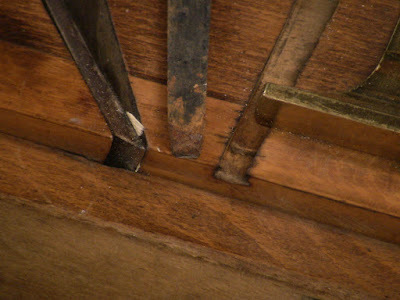 That ugly bit of rust in the middle is the cross-grain nicker removed from it's dovetail. After the same cleanup as the iron. It's good to have clean nickers. 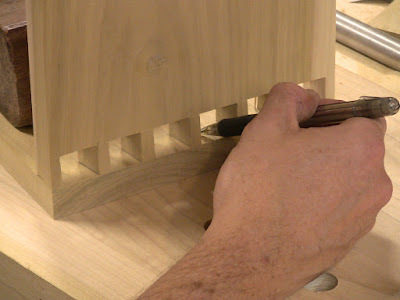 Using the moving fillister plane to make a fillister (cross-grain rabbet) on the bottom piece. 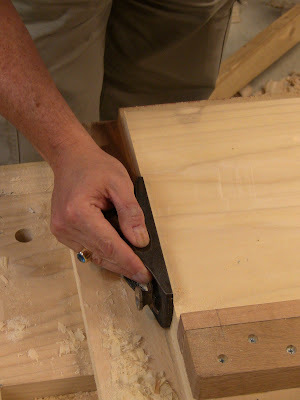 Oops, I didn't have the nicker in cutting position, so I was building up an advancing shoulder with each pass. 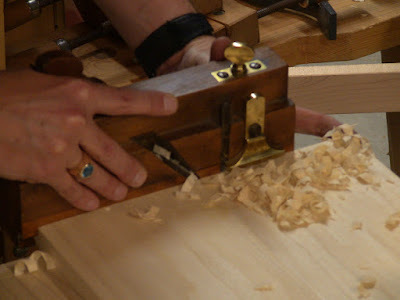 Using the shoulder plane to clean it up. With the nicker down and some beeswax on all the bearing surfaces, it went much better. 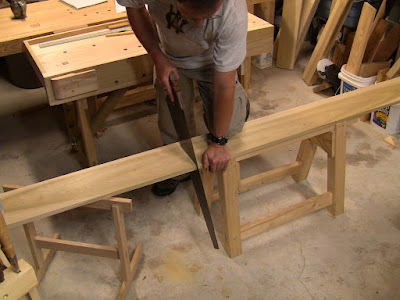 Rabbeting the length of the bottom, with the grain. These ribbons are pure joy to make! 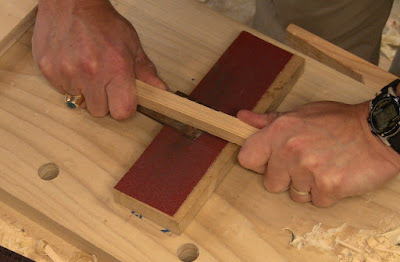 Using the groove in one of the end pieces as a mullet to check the remaining thickness for fit. Test fitting the bottom in the grooves. Moment of truth: full test assembly. It goes together well, and wonder of wonder, all rests flat! That's not guaranteed, you know. The movement clearances around the edges are perhaps too generous, so I could have reduced the width of the rabbets. All glued up and no place to go. The spray bottle and paper towels are for wiping off glue drips. Next will be making the top. 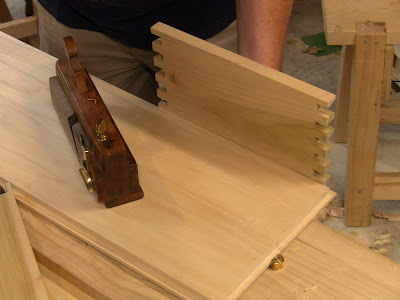 I want to make a simple raised panel in a grooved, dovetailed 2"-deep lid. Happy 20th to my son! For his birthday present, I'm not showing him how to do all this (after his Eagle Scout project, he vowed never to pick up a tool again)! Nice to see the break down of each step. Looks like you're doing some beautiful work. Would love to have a big wooden plow but I'm looking at getting the veritas small plow plane. Veritas just announced a kit you can add to the Small Plow plane to cut T&G plus wider grooves.